Infringement occurs when a person exercises one of the copyright owner’s exclusive rights without permission. Not all unauthorized uses of a copyrighted work constitute infringement, however. Federal copyright laws place limitations on the grant of exclusive rights. For example, the act of reproducing part of a copyrighted work may not be infringement if the reproduction is used for certain purposes, including news reporting, teaching or commentary. This limitation on copyright is known as "fair use." To enforce his copyright, a copyright owner may file a lawsuit in federal court, alleging infringement by a defendant. In court, the copyright holder must prove that his copyright is valid and that the defendant’s actions infringed upon his statutory rights. In a civil lawsuit, enforcement of a copyright entails injunctive relief and monetary compensation. This means that a court can order the offending party to stop using the copyrighted material, and also order that party to pay the copyright owner. The Copyright Act enables courts to provide injunctive relief that is “reasonable to prevent or restrain infringement.” After a copyright infringement lawsuit is filed, but before the case is tried, a copyright holder may petition the court to issue a preliminary, or temporary, injunction to prevent the defendant from continuing the alleged infringing behavior. 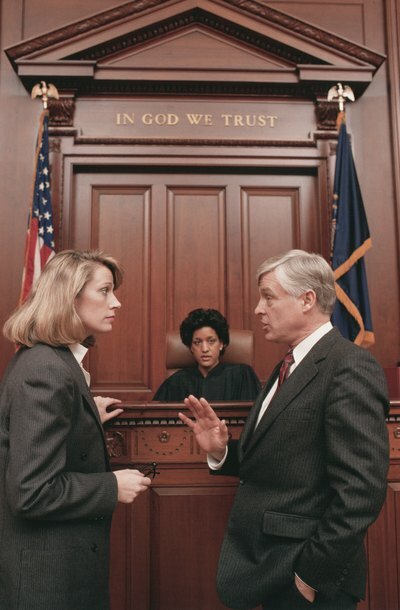 An injunction is a court order that requires a person to perform, or to refrain from performing, a specific act. To determine whether an injunction is necessary in a copyright case, a judge examines the broad situation and weighs the likely impacts of an injunction on each party. A court may also issue a permanent injunction if the lawsuit results in a finding of infringement against the defendant. This type of injunction prohibits the defendant from engaging in future infringement of the plaintiff’s copyright. When a copyright owner wins an infringement case, the court typically orders the defendant to pay monetary compensation for losses that the plaintiff suffered as a result of the infringement. There are three types of monetary compensation in copyright cases: damages, profits and statutory damages. Damages are the actual harm caused by the infringement — sales lost by the plaintiff, for example. A copyright owner may also recover any additional profits that the defendant made as a result of the infringement. Actual monetary losses are difficult to prove in many copyright cases. The Copyright Act allows plaintiffs to request courts to award statutory damages in infringement cases if the copyright owner registered the copyright with the U.S. Copyright Office before the infringement occurred. Statutory damages can range up to $150,000. The Copyright Act also gives courts the discretion to order a copyright infringer to pay court costs and a plaintiff’s reasonable attorney fees. Most copyright infringement cases are enforced through civil lawsuits. In the most serious cases, an alleged infringer may also face criminal charges. To be criminally liable for copyright, a person must have committed the infringement willfully. The infringement must also satisfy one of three specific requirements: it was for the purpose of gaining a commercial advantage or a private profit, it involved the reproduction or distribution of at least 10 copies of a copyrighted work that have a total value exceeding $1,000, or it involved the distribution of a work being prepared for commercial distribution over a publicly accessible computer network. Copyright infringement can be a felony or a misdemeanor. A felony charge must involve an infringement of the copyright owner’s reproduction or distribution rights. A felony conviction carries a maximum sentence of five years in prison and a maximum fine of $250,000. A misdemeanor charge results when either the reproduction or distribution involves only a few copies or resulted in little economic gain or if the infringement involves a copyright owner’s other exclusive rights, such as public performance. A misdemeanor carries a maximum sentence of one year in prison and a $100,000 fine. What Happens If You Break Copyright Laws? Copyright protects creators of original works, such as songs, books, articles, software, art and photos. Anyone who republishes, reproduces or redistributes a copyrighted work without the owners' permission is guilty of copyright infringement, although there are a few important exceptions to this rule. Copyright infringement is a federal offense, and the laws governing copyright infringement, including penalties, are contained in Title 17 of the United States Legal Code. The laws of copyright protect original created works, including graphic images such as cartoon characters. Any person or company may claim copyright to a unique and original creation; the copyright holder has the right to register the copyright with the U.S. Copyright Office. Registration allows the copyright holder to sue for damages if his creation is copied, sold or reproduced without permission. What Is the Punishment for Violating a Patent? Patent laws encourage creativity by allowing inventors to profit from their inventions. In essence, a patent awards inventors the exclusive right to market, sell or use their inventions. Patents are authorized in Article One, Section 8 of the U.S. Constitution. Accordingly, the federal government issues patent laws and sets forth a number of remedies that serve as punishment for those who violate patent rights. What Happens If Someone Breaks a Copyright Law? What Can Legally Happen to Someone if They Commit Copyright Infringement?